Patchsee patch cords provide a simple, yet effective way of tracing your network cables. Their solution allows you to quickly identify the ‘other’ end of the installed patch cable by using the Patchsee Torch. The clever light technology works in exactly the same way across all of the Patchsee Cat5e, Patchsee Cat6 and Patchsee Cat6a patch cord range. Each Patchsee patch cord is fitted with 2x integrated fibre optics on the inner side of the cable which then bend back 180 degrees at either end. This means that the transmitted light from the supplied torch shines away from the racked equipment, providing you with an immediate and positive identification. Therefore, in just a few seconds you can instantly eliminate all the usual guesswork when trying to locate the correct cable for installation, disconnect or a re-patching exercise. A new installation tends to be completed all neat and tidy, but in reality moves and changes are inevitable - often required quickly, with little or no prior notice. Over time we start to see an array of messy cables and the best practices that were intended when first installed have gone by the wayside. There is no specific vertical market sector for Patchsee. Clients across both the private and public sector could benefit equally – from a small server room to a large data centre. Basically, anyone whom requires mission critical network performance, then this is a great solution to implement. Patchsee is fully standards compliant for speeds of up to 10 Gigabit and comes with a 25 year warranty. During manufacturing each Patchsee Patch Cord is given a unique serial number, so in my opinion a really decent level of quality to start off the process. Patchsee have developed their own PCI connectors and use 50 Micron Gold plugs as standard. There Cat6a cable boot has a stainless steel metal spring which provides added strain relief for high density patching scenarios. Every cable has its own length and type printed on the underside of the cable boot - another great feature. 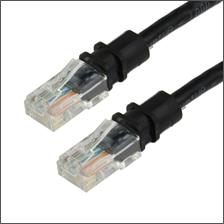 There are 6x standard lengths across all Patchsee Cat5e, Cat6 and Cat6a cords – all of which are available in both UTP and FTP variants. These lengths are 0.6m, 1.2m, 1.5m, 2.1m, 3.1m, & 4.9m. 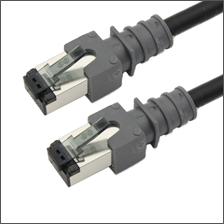 In the Patchsee Cat6a range there are an additional 13x lengths available, offering by far the largest industry choice for standard Cat6a patch cables. All Patchsee UTP cables are constructed with a PVC Jacket, whereas the Patchsee FTP option is made to a LSZH (low smoke) standard. It’s the longer length Patchsee cables where the light technology really does come in to its own as the cable identification becomes much more tricky, especially when you’re installing Zonal or Top of Rack deployments. The Patch Light is available with a Red, White or Green transmitted light which can be set to either a flashing or steady light mode. All Patchsee cables are Black in colour, but you can then select from up to 16x different coloured plastic clips for that easy first level identification. 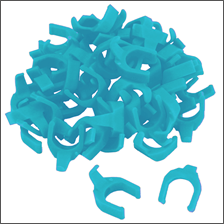 Each blister pack contains 50x Patchsee clips that fit securely on to the cable – perfectly aligned with the boot, so no extra width or bulk being added to the cable. Also, the Patchsee coloured clips are fully re-useable, so no limitations like what you would normally have when trying to colour code standard patch leads. The good news is that Patchsee hold around 200,000 stocked products ready to ship immediately. Orders are then delivered from either our local UK warehouse on a next day service, or for larger requirements they ship directly from the global logistics centre in France with a 3-4 day lead time. We can expedite most orders if they’re required for an urgent installation. Patchsave Solutions always have offers and promotions running around the Patchsee range – just send us an email or give us a call to find out more. Please do keep in touch and thanks for reading.